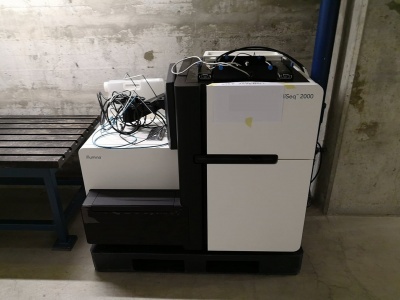 The Illumina HiSeq 2000 and 2500 are advanced DNA sequencing machines that have been replaced by a new generation. Institutes and companies around the world are getting rid of them, they are now available for a fraction of the original cost and can even be obtained for free. Urs Gaudenz managed to get a hold of a machine and document large parts of the hardware and the internal communication protocol in detail on the Hackteria Wiki. 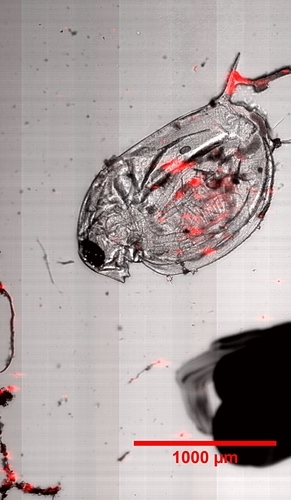 The image you see is a high resolution scan of a water-flea made using an early prototype of the control software we are developing (full resolution). The combination of bright light and fluorescent scanning shows the micro-plastic ingested by the perished animal and indicates the disturbing consequences of disposed plastics decomposing in our natural environments. The HiSeqs are high resolution microscopic instruments with a large scan area, a precision movable stage, multi-channel fluorescence capabilities as well as microfluidics flow cells. They have countless other applications for researchers and citizen scientists if there were usable software to drive them.